Be sure that you are getting plenty of rest every night; the required amount is said to be 6-8 hours of sleep every night. Along with 8 hours of sleep, be sure to drink plenty of water and avoid sodas. 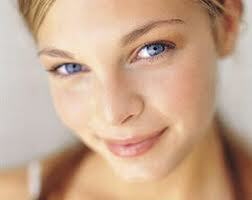 These two things can greatly improve your skin’s complexion, and help heal the circles around your eyes. If your goal is to clear skin without using makeup, then washing your face twice a day should become part of your daily routine. You’ll spend a fraction of the time washing your face as you would applying and removing makeup each day. Choose facial cleansers and exfoliates according to your specific skin type for best results. Your eyebrows are the easiest feature to manipulate on your face. You can change the shape and size easily by visiting a salon, or by learning to wax and pluck eyebrows yourself. When you keep your eyebrows maintained, your face looks clean and put-together without using makeup, while also framing your face and drawing attention to your eyes. But always be cautious as to not over-pluck, because this can create more problems for you in the future. Apply a moisturizer every day to your face and body. For your face, you’ll want to apply a moisturizer that includes an SPF – even on days that aren’t sunny. After all, the sun’s harmful rays can get to you even on overcast days. At night, you can use a nighttime moisturizer after you cleanse your skin; this will improve your moisture, and make your skin soft and smooth. The food you eat is very important for staying healthy and youthful. This being said, you’ll want to eat plenty of fruits and vegetables to make your skin glow. A trick is to eat one cup of fresh fruit or vegetables before every meal in order to get your full servings of important nutrients. Read about beauty foods to improve the look of your skin, hair and nails. Before you decide on a hairstyle, be sure it will suit your face shape and hair type. Not every haircut will look good on every girl, and it’s very important not to have the wrong hairstyle since this distracts from your face, and can cause you to look unappealing. Only shampoo (how to choose hair shampoo and conditioner) your hair when it is needed; for the average woman, this is every other day, unless your hair frequently becomes oily. You’ll want to only apply conditioner to the ends, and pony-tail a section of your hair before rinsing well with cool water to boost your hair’s shine, softness and smoothness.